Satin ribbon is a very popular choice for clothing, floral design, invitations, paper crafts, gift wrap, and countless other uses. 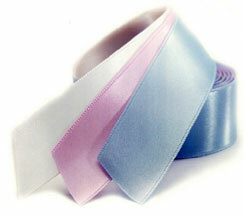 Our Swiss Double Face Satin Ribbon is a favorite with bridal shops and designers. We also feature other qualities of Satin ribbon. Double face satin ribbon and single face satin ribbon are available. We also feature wired satin ribbon and unwired satin ribbon.